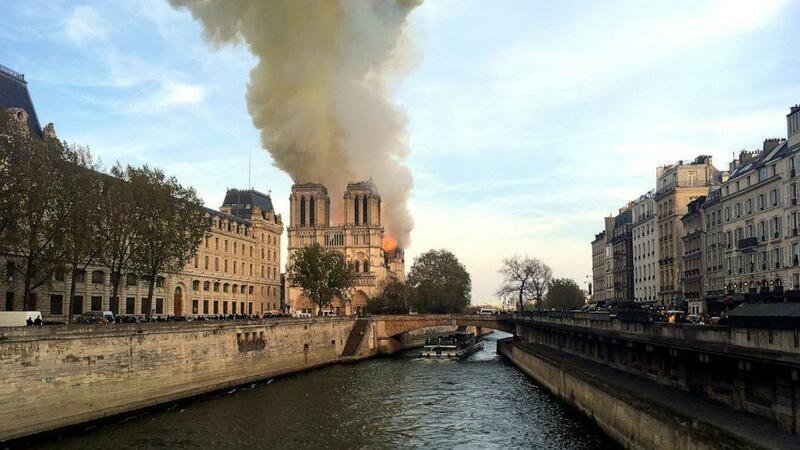 PARIS, April 16 (Xinhua) -- The world is in grief over the 850-year-old Notre Dame Cathedral in Paris, which is devastated by ferocious blaze on Monday afternoon. 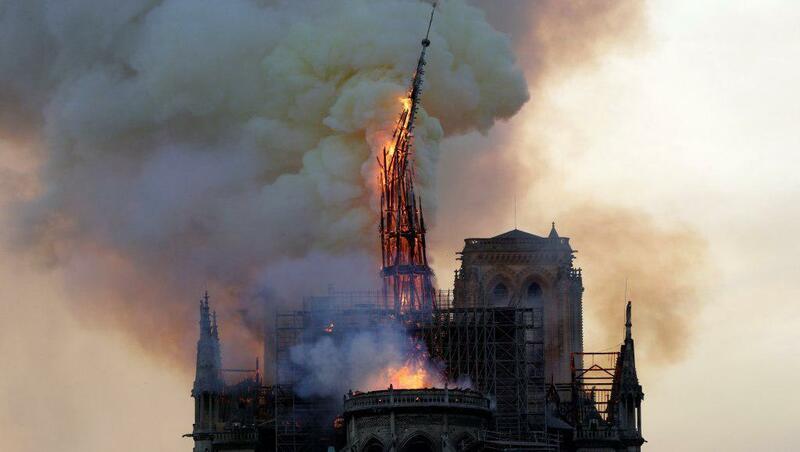 The fire, now "under control and partially extinguished" according to firefighters, has destroyed the spire and the roof of the centuries-old cathedral, which attracts millions of foreign visitors every year. "Notre Dame de Paris in flames. Emotion of a whole nation ... Like all our compatriots, I am sad tonight to see this part of us burning," French President Emmanuel Macron tweeted. World leaders on Monday expressed shock and solidarity with the French people, lamenting the loss. British Prime Minister Theresa May tweeted that "my thoughts are with the people of France." She also mentioned the emergency services there, who "are fighting the terrible blaze at Notre Dame Cathedral." German Chancellor Angela Merkel said she was deeply saddened by the fire. "It hurts to see these horrible pictures of the burning Notre Dame. Notre Dame is a symbol of France and of our European culture. Our thoughts are with French friends," Germany's Government Spokesman Steffen Seibert tweeted on behalf of Merkel. In a message to Macron, Italian President Sergio Mattarella wrote that the whole of Italy "stands in sincere friendship with the people of France." Speaking to Italy's national public broadcasting company RAI, Italian Prime Minister Giuseppe Conte said he will contact the French government to express the solidarity over the tragic incident. Portuguese President Marcelo Rebelo de Sousa and Prime Minister Antonio Costa respectively sent their heartfelt condolences to Macron. "It is a tragedy for the French people, for the Europeans and even for all the world," Rebelo de Sousa said, while Antonio Costa said on Twitter that a part of "our European history disappears under the flames." Greek Prime Minister Alexis Tsipras said the country lamented the fire that devastated the Notre Dame Cathedral, adding that not only Paris and France are mourning, but the entire world. U.S. President Donald Trump called the massive fire at Notre Dame Cathedral in Paris "horrible." London Breed, mayor of U.S. city of San Francisco, the sister city of Paris, also voiced solidarity with the people of Paris. Brazil's President Jair Bolsonaro expressed his regrets over the massive fire "on behalf of all Brazilians." "In this gloomy moment, our prayers are with the French people," he tweeted. Moroccan King Mohammed VI also sent a message to Macron, expressing on behalf of himself and the Moroccan people full support for and solidarity with the French people. Meanwhile, United Nations Secretary-General Antonio Guterres expressed his "horror" at the images of the fire, shown live around the world. The UN chief tweeted that the cathedral is "a unique example of world heritage that has stood tall since the 14th century," saying his "thoughts are with the people and government of France." The fire was thought to be linked to renovation works being carried out at the medieval cathedral, and an investigation has been launched by Paris prosecutor office to determine the cause.